No matter if it's for a birthday, anniversary or some other special occasion, browse our online store of Las Vegas Harley Gifts. We have Vegas branded Harley poker chips that make a great token to remember visiting the entertainment capital of the United States or to commemorate passing through the city on your hog. For more practical Las Vegas motorcycle gifts, try one of our tote bags, good for carrying everything from school books to groceries. Everything in our store makes a great addition to your Harley family decor, including cozies to keep your beers cold in the summer sun and shot glasses for the party animal inside you. 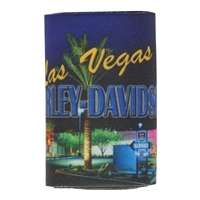 Remember to check out our Las Vegas HD branded gifts and novelties for your next special occasion. All our items provide a blend of rugged individualism and American pride. For any questions regarding selection or general information, feel free to reach out to us at customerservice1@lvhd.com.